In times of both economic prosperity and uncertainy, the strength, stamina, confidence, enthusiasm, and positive outlook of leaders are needed in all sectors of society — whether that leader is the President of the United States, a Senator, CEO, COO, teacher, professor, pastor, reverend, office manager, volunteer coordinator, and head of household, it is natural that some are born to lead the various flocks of communities: this is their calling, and burden. Such a role has great responsibility, with ethical and moral implications that inevitably affects the lives of others. Human beings frame their lives around stories and narrative — this is true from the movies and TV shows we watch, news items, parables, jokes, and office politics. In the case of business, it is a story about confidence as well as a story about the lack of quality in key level executives and upper/mid level management as perceived by the public (e.g., consider the backlash at the A.I.G. management on all levels). Everyone, regular employees and upper management, are fearful for their jobs and futures, so they turn to someone in a “parenting role” to find confidence and reassurance. But what does it mean “to be confident”? Is this the appropriate behavior these days? Do CEOs and Presidents have any confidence left? It’s an ethical and moral issue: one can feign confidence, lie to employees, tell them that everything is just fine, not to worry, when that’s far from the truth and pink slips may be issued at the end of the week. This is called overloading the sugar coating. Or one can be brutally honest, tell it as it is, try to put a positive spin such as: “Things run in cycles; things will be back to normal next year,” and risk the lowering of morale in the work place. 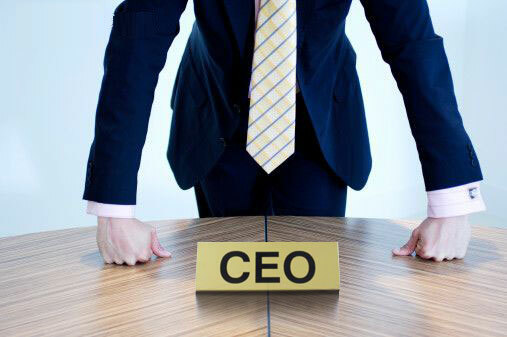 Today’s CEO faces challenges as both business folk and leaders. As business person, they are challenged by cash, credit, customers, cost. As leaders, they are challenged with the role of the confident, calm and courageous figurehead. It is not only about the P&L — it is about the psychology of the CEO. It is difficult for a CEO, if s/he has knots in the stomach about the company’s future, to go into the office and project absolute confidence for costumers, employees, vendors, and bankers. This leader has to have that confidence and must project that confidence. Forget the knots in the belly. Otherwise, one might as well give up, call it quits, shut down the place, file for bankruptcy. No one wants to do that…but some are doing that. But do they really need to? Or do these leaders lack the courage to face adversity, to play the role of David with the economy as Goliath? Give people the truth about what’s not working and the sacrifices they need to make; if a CEO gives them a clear and compelling reason for why and if one empowers them and enables them, this exercising good leadership. It is not confidence with deception, it is not sugar coating. It is telling it as it is, with sleeves rolled up for the fight. The CEO will be surprised how much the troops will rally and jump into the ring, rather than cowering behind a rock. Right now, the word “CEO’ has a bad taste in the public’s mouth because of all the companies such as AIG and the Detroit car companies and banks asking Congress for tax payer bailout, only to find out the money is not being used to the benefit of the community, and that some CEOs are getting “golden parachutes” and bonuses they may not be entitled to, since their companies are failing. This is not the case of all CEOs. Today’s average CEO struggles with shaking that image as a crook or someone who does not care about “the little people.” Not all CEOs are corporate demigods — many of them are owners of their own businesses and when you’re an owner of your own business, your net worth and your identity are inextricably tied to your business. Most of their wealth is in that business — their reputation, their life blood is in that business. If the business goes down, they don’t walk out with big bonus checks and go on to the next gig. Their own net worth has gone down the drain and they are left with great shame because the baby they have spent their lives building has just been sent to the gallows. With confidence, there must be courage – the courage not to quit, not to give up, to seek out the advice of peers, to make hard decisions that will be best in the long run. When there is courage, the employees will see that, they will know that their leader is not lying to them just to get through the day. So: don’t sugar coat it, you CEOs and company presdients out there. Be honest, be pragmatic, but show courage and confidence that toda’s economic woes will be yesterday’s bad memory, and “blue skies” are indeed in the near future. I just came home from a seminar by Paul Manwaring called “A Culture of Honor.” As he spoke about how carelessly people criticize each other on TV and in daily life – and how uplifting it is to receive words of affirmation – I was struck by how little appreciation most entrepreneurs get from… well, anybody. The evening news is no celebration of business people, that’s for sure. The government ain’t doing much to make your job easier. So… why would you risk everything, endure multiple bankruptcies, work 17 hours a day for weeks and months at a time, to be the first to be taxed and the last to get paid in a game that offers no guarantee of success whatsoever? It takes a very special kind of person. It takes a person who is driven from the inside by passion and vision and a bit of eccentricity. It requires you to be so dissatisfied with the status quo that you feel like you can endure anything so long as it’s not the present mediocrity. You’re one of those people who just can’t stand following the car ahead of you on the expressway to some cubicle for the rest of your life. Or maybe you have this idea for a product or a way of doing something and you’re convicted to your very soul that the world needs to see things *your* way for once. In any case, I doubt it’s because you’re just some greedy, money-grubbing over-achiever who needs to take a chill pill. No, that popular depiction is deeply misleading. I just want to say… Wherever you are in your journey, I’m proud of you, I HONOR you, and I cheer you on in your effort. Any honest business is a noble and honorable thing. I’ll never forget my 2nd trip to Africa. I’m somewhere southwest of Nairobi Kenya, visiting George Karanga and his wife Jane, two very special people who run a foster program for AIDS orphans. I’m meeting a woman whose husband is dying of AIDS, he’s down to 66 pounds… all kinds of kids who’ve lost both parents to HIV and now live with aunts, uncles or grandparents… people who are deathly sick for lack of $1.00 for a bus ticket to go to a medical clinic… a woman who’s 8 years a paraplegic, living under a tin roof in a dark mud hut, her sole entertainment her radio, her cat, and her kind neighbors who look after her. But the epiphany occurs when I meet a fellow named Paul Mungai, who runs a cobbler shop. Paul, ironically, is crippled, but he knows how to make and fix shoes. And he knows how to run a business. He started with just $50.00 of seed money and now has, by Kenyan standards, a sound business. He’s feeding his family, he’s paying his rent, his kids have uniforms to wear to school, and everyone in his care has enough to live on. There’s a gleam in his eye. We exchange a few words and share our mutual understanding: There is one and only one path out of poverty. The one and only path out of poverty is entrepreneurship and business success. It ain’t government. It’s not social programs. It’s not charity. It’s not even jobs or technology. It’s entrepreneurship. The message was loud and clear: What you and I do may be daring, crazy, irrational and largely misunderstood. Condescending do-gooders may tell you you’re greedy or too successful. Your brother-in-law may think you’ve got your head stuffed in a cloud. The government may think it has the right to confiscate your profits and give them to “education” or other well-intentioned social programs. You might cater to some strange market, doing something that most people consider frivolous. But the fact remains: What you and I do is profoundly important. You and I pave the road that leads from poverty to success. We create the ingenuity and jobs and wealth that makes good medical care possible. We create the world that has enough to eat, the world where even welfare kids in housing projects get three square meals a day. So don’t ever apologize to anyone for doing what you do. If it wasn’t for you, me and the rest of us entrepreneurs, “they” would still be sleeping on dirt floors. That conversation with Paul in Kenya sparkled with the mutual awareness of what I just described to you. And as George took me to see other recipients of Micro-Enterprise seed funding – a lady selling sardines and tomatoes on a nailed-together stand on the side of the road, several women selling fruits and vegetables in the local markets, I thought of the entrepreneurs I meet in the US, Canada and Australia. I thought of those rah-rah Amway rallies I was going to years ago, and the easily-exploited naivet? that’s so characteristic of the “Biz Op” market as it’s sometimes called. And like it or not, it’s that raw enthusiasm and independent spirit that drives the prosperity of the West. Where that drive, imagination and ingenuity are lacking, people starve – literally. So yes, some business people are too greedy. Some entrepreneurs don’t care about their fellow man. Some people do make their money by dishonest means. But remember, the character quotient is no better on the poor side of the fence. So if you’re prospering by means of an honest enterprise – or if you’re struggling to put one together – then you are a hero. The bards and minstrels may not sing songs about you, and your handsome face may never appear on The Apprentice, but what you do every day when you get out of bed is a worthwhile and indeed necessary thing. Don’t ever forget it. What you do matters. A lot. It’s worth celebrating and it’s HONORABLE.